Jumanji 3 was officially announced at the end of June, following the massive success of Jumanji: Welcome to the Jungle. While the sequel is still being written, director Jake Kasdan took some time to discuss the upcoming film along with how he might be changing the game and how it will tie into the previous two movies. 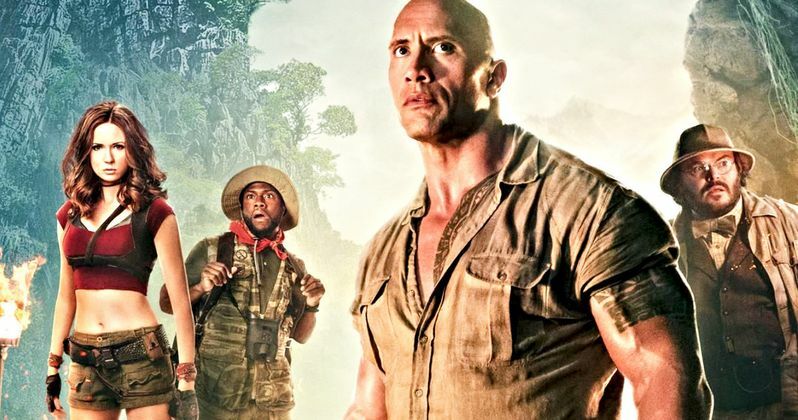 Dwayne Johnson is returning for Jumanji 3 along with Jack Black, Kevin Hart, and Karen Gillan, who will star with some new characters that have yet to be announced. Jake Kasdan appeared at the ABC party for the Television Critics Association to support Speechless and Fresh Off the Boat, which he executive produces. The director/producer was asked about the writing process for Jumanji 3 and was prodded for further information. Kasdan obviously could not reveal much about the sequel, but he did discuss some possibilities. For instance, when asked if the returning actors will play themselves or different characters for the new game, the director said, "/jumanji-3-production-start-date-early-2019/We're just figuring all of that out now." The interviewer than asked about a Jumanji 3 idea in which the current cast goes in for a new game where they all switch characters, allowing for the actors to take on each other's personalities. However, the movie is still over a year away from hitting theaters, so Jake Kasdan wasn't really forthcoming with information, though he did indicate that he liked the idea of the cast switching characters, saying, "It's a good idea." The idea is actually really clever for a different way of looking at the sequel, much like how they flipped the script in Jumanji: Welcome to the Jungle and took audiences on a new journey. Jumanji 3 will have more of a connection to the last movie than it will to the original, says Jake Kasdan. With that being said, the third installment will preserve the continuity, throwing references back to the first Jumanji movie as well. Kasdan confirms that the upcoming movie will strive to keep that continuity, which is one of the only things that he was able to open up about. Kasdan explains. "Our hope is to keep a long continuity through the whole thing, even though the story that we're telling in the second movie, the movie that we're working on right now is much more connected to the first movie that I made a year ago than it is to the original. We love the idea of keeping all of this together and connected in some way or another." Jake Kasdan was also asked if Jumanji 3 will continue in the video game realm to which he said, "I believe it'll be sort of a continuation of that idea, yeah." Again, the director cannot say a lot about the sequel, not only because it's so far from hitting theaters, but also because the story is currently being written. While a video game will more than likely be involved, the story could continue to evolve into a more modern gaming console or even through a smartphone. It will be interesting to see how Kasdan and crew decide to take Jumanji 3 after the massive success of the last installment. You can read more about Jake Kasdan's plans for Jumanji 3 over at Slash Film.